I first saw Ellen Gallagher’s paintings at the Freud Museum in London (Ichthyosaurus, 2005) when I was immersed in the myth of Drexciya. The idea being when pregnant African women were transported like cargo over the Transatlantic, and if they became ill, they were thrown overboard. The unborn children created new societies in the water and these incredible underwater empires were formed. The myth, created by the Techno group Drexciya, was established in 1994 and their music reflects that deep bass-induced vibration that is often used as a metaphor for the sea. The band gave no interviews, and the group remained anonymous until James Stinson’s (of the Detroit-based group Underground Resistance) death in ’02. The other band member Gerald Donald continues to make music under different aliases. In his essay, ‘I’ll dream fast asleep’, that travels through literary criticism to personal biography, he landscapes Gallagher’s (who he calls Ellen throughout) art and gives us this beatific translation of her paintings through historical and literary adaptations from Melville to Dürer. He positions Gallagher as a lover of water – she now divides her time between Red Hook in Brooklyn and Rotterdam. ‘Sites connected by this same green-grey water, the storied Atlantic, and the abused ocean – a conduit for her forebears, and the provocation for her practice’. 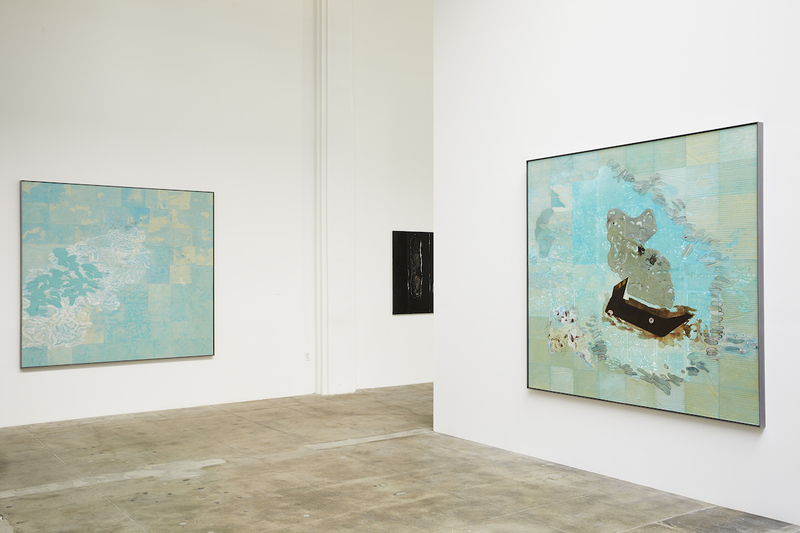 In the show at Hauser & Wirth, in downtown Los Angeles, the space is quiet, like still waters. Her paintings create calm and reflection from their audience. The book displays these works on glossy and matt pages, partial close-ups, Whale Falls (2017), and Dr Blowfins (2014) and repetitive displays of others, Hydropoly Spores (2017). 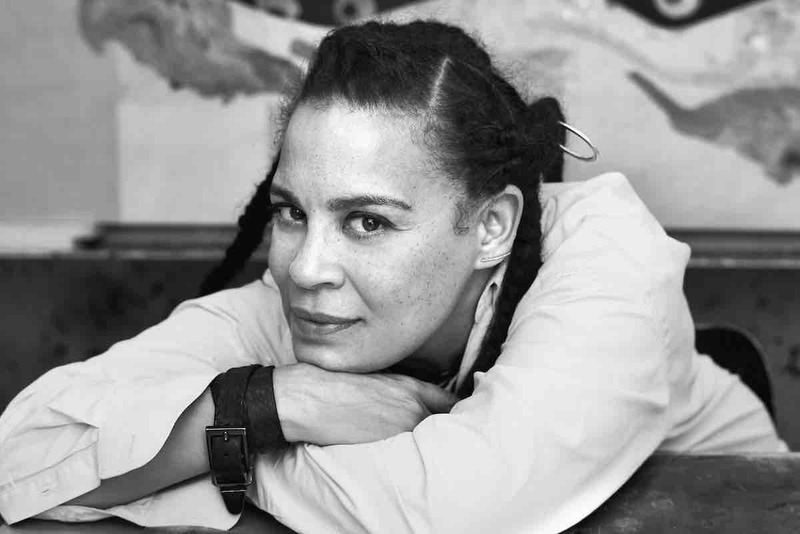 Curator, Adrienne Edward’s brilliance bounces from the page unpicking the art historicity of Gallagher’s work in ‘Vectors and Veneers: The Thickness of Blackness’. In particular, I found the focus on her painting Odalisque (2005) very satisfying. 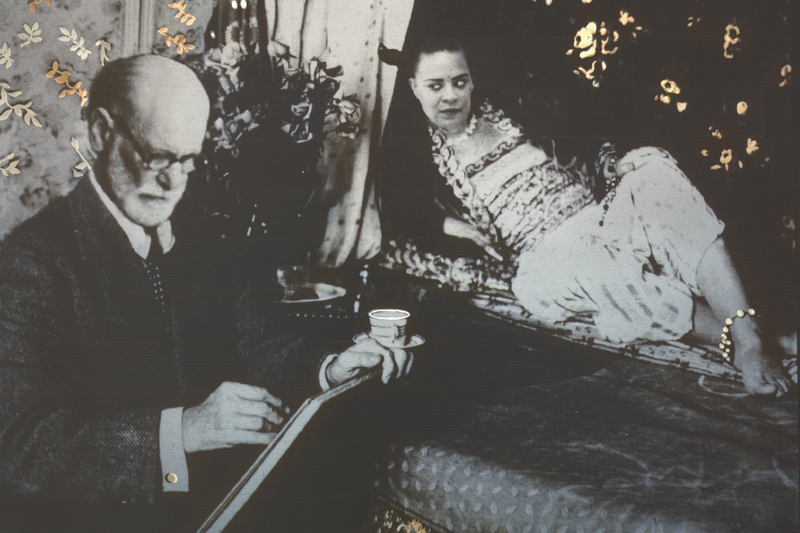 Edwards describes in detail the meaning behind the work, the referencing of Matisse, Picasso and Orientalism while celebrating Gallagher’s insightful transformation of Matisse to Freud and the unknown model to herself. ‘While Picasso and others in the Paris art world were struck by the radical gesture of the female subject’s direct confrontation with the viewer, what is most relevant here has less to do with perspective than with the techniques of formal innovation that ultimately return us to the significance of the gaze and who is looking; a central concern for Gallagher’. That Gallagher is concerned with the concept of the gaze is not an overt concept in her work. Her paintings consist of subtle interplays between nature, subjectivity, and identity. There is everything from the physical act of layering her canvases and carving meaning into her work to the playful acknowledgement of difference. The book includes images of her delicately drawing onto her canvases, with only parts of her head and face visible, obscuring the identity of the subject, rendering the photographs part of a feminist project. Accidental Records reads like alterity to the Hauser & Wirth exhibition. The book is a profound exploration of what Edwards describes as ‘fugitive surfaces – paradigms of resistance, as what may have remained invisible rises through the cracks, animating from within, and up in the raking black light; a line of flight’. The 2016 four-painting series entitled ‘Negroes battling in a cave’ is essential to see in person to engage with its dark references and trenchant narrative. 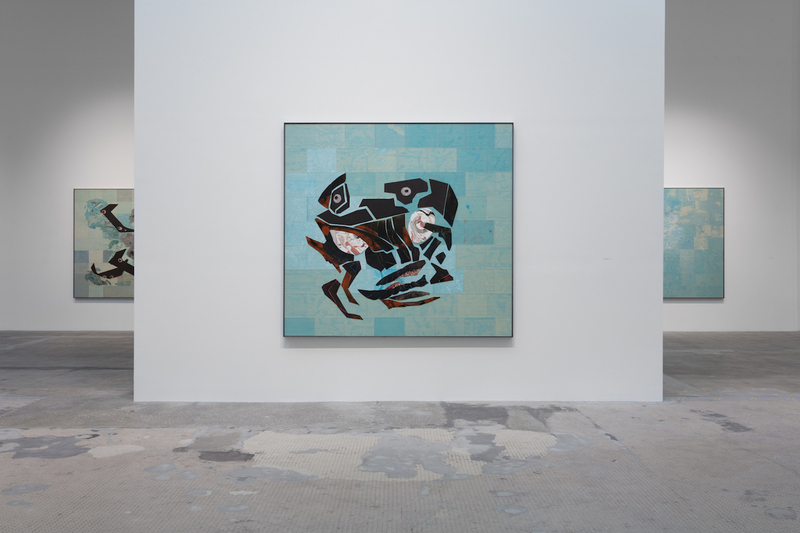 However, Edwards carefully delineates the meaning behind the series, which she included in her 2016 group exhibition at Pace Gallery, Blackness in Abstraction. ‘Gallagher created a new suite of four black paintings entitled Negroes Battling in a Cave…which took as their point of departure the recent discovery of a racist joke – ‘Negroes battling in a cave’ – handwritten under Kazimir Malevich’s Black Square (1915)’. 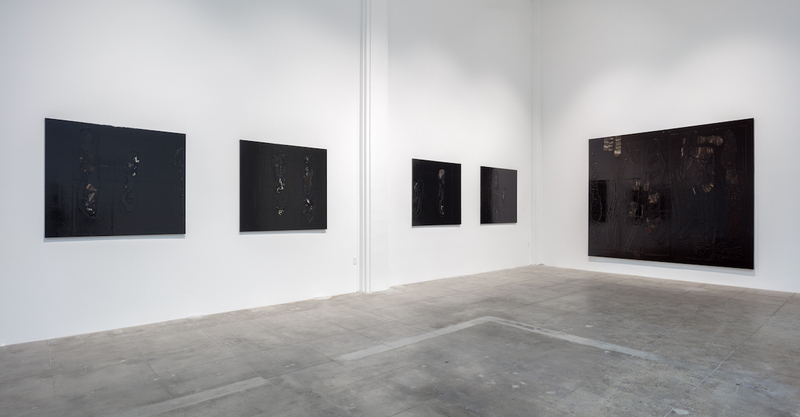 The series, in black, uses collage, enamel and both ink and rubber to build an immersive experience – one where we are at the shiny, reflective surface looking in, while simultaneously struggling to surrender ourselves amidst the rubber and carefully layered magazine remnants. The subtle referencing Gallagher uses in her work to water, her own subjectivity, to an American politic and to a broader art historical narrative all coalesce in the exhibition and are immaculately rendered in the book. And in both the book and the exhibition, Gallagher has produced a potent symbolism that seeks our engagement – both bodily and intellectually. Accidental Records is on show in Hauser & Wirth, Los Angeles until Jan 28, 2018. The book is available from their store.